Titled- Pan Afrikanism: Myth or Reality? I met Prof Jean-Jacques Sene at a book launch event held at Ivuma Art Center in Kgosi Galeshewe community. 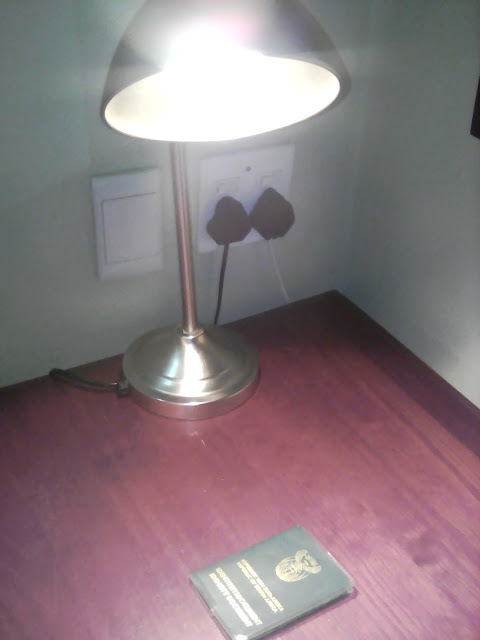 He was accompanied by Sabata-Mpho Mokae to review a book titled ‘Reconnecting with the Universe by Maphumulo Khumisho Maputle” I must confess his thoughts and account of the technicalities, and nitty gritties of the book was impressive. Which will be a topic for another day, where yours faithfully will share his thoughts on the book launch and input on the book itself. I felt I was in an introductory tuition to literature and philosophy, his enthusiasm was what drew me close to pay attention to several concepts he touched on that night. He has a keen interest in what you have to say and one’s overall outlook on life. Thus the announcement of his official public lecture at Sol Plaatje University was an event I would not miss for anything, because often this platform offer an opportunity for one to sip from the wealth of knowledge reservoir the expert possess. He once said “writing is a solitary exercise’’ that takes significant discipline to sit all alone scavenging through every little piece of text and audio to produce a piece that will add value to the body of work in existence. That struck the nerve and spurred me to reflect on the amount of sacrifice and work writers put in, to give us something to read, think and talk about. I resolved at that moment this is the man worthy to be listened to, his lived experience in the United Snakes of America, Euro-caucus and Asia was a cherry on top. The esteemed Professor JJ Sene is a well-travelled man, his travels spans corners of the world currently based in Pittsburg at Chatham University. I hope he had taken land in those foreign lands like settlers have done in the north and south of the African continent. Its an issue that needs attention when we meet once again in the motherland or his domiciled country, which has knack that constantly irks my sensitivities. An Associate Professor of History, Cultural and Conflict studies. Hails from the majestic and beautiful country on the west of the Afrikan continent, called Senegal. Like the Apartheid paratroppers used to say at the height of the regime a “native” of Dakar. His interests according to Chatham University are “Mythological dimensions of political power; political philosophy and neo-socialism in the global arena; historiography of conflict; and international education” reading his interests leaves me with no choice but to wonder what would he have suggested in dealing with an “central issue of conflict” succinctly put, LAND. With its concomitant issues such as dispossession of the 80 % of the population and socio-economic chaos. 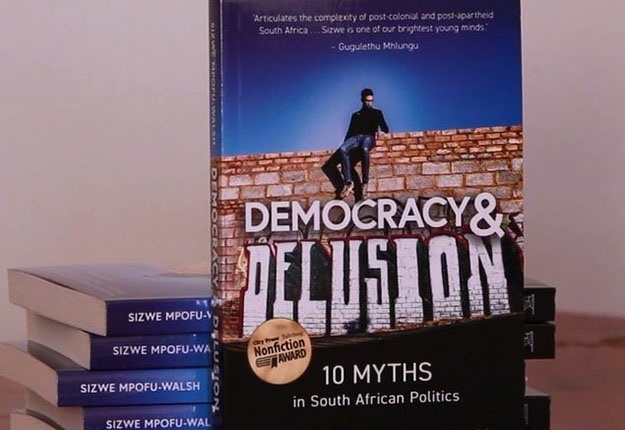 I might be digressing but its opportune to link the South Afrikan experience and issues with Prof Sene’s sets of expertise because he saw the perpetual economic and social disaster Afrikans in the South are in. Nevertheless as you know Professor Sene was a visiting professor at Sol Plaatje University’s Faculty of Humanities and Social Sciences. To be quite honest I am not certain what that entails but I think it has to do with giving lectures for several weeks on certain subjects of his expertise and transfer his lived experience to students as part of their learning. I hope one of the students that had an encounter with him in class could give an account of their experience, as I believe the onus is upon us to document every little thing of our journey in this life. On the 31 August 2017, it was date scheduled for the highly anticipated public lecture in a while, after the postponement of the initial event. 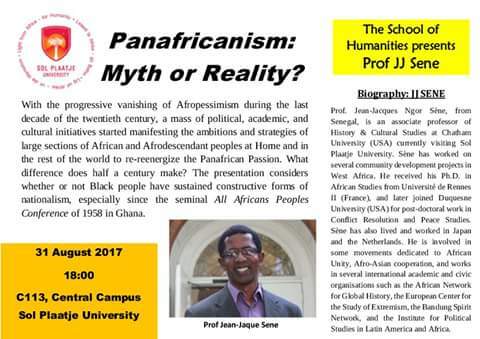 Prof Sene Public Lecture titled- Pan Afrikanism: Myth or Reality? Brought the chills down my spine being a staunch Pan Afrikanist, with my ideological grooming which started in Pan Afrikanist Student Movement of Azania. Here is a man who has walked the dusty streets of Dakar where once a giant Mwalimu Cheik Anta Diop walked. A man who stepped on the footprints of Leopold Senghor and followed him till the academia “slaughterhouses” of France, to invoke the spirit of Du Bois in pursuit of ideas. He stood there with smile on his face as he fiddled through his notes. His host and chairperson for the day Dr Jasmael Mataga gave an intimate introduction of the visitor. Sabata-Mpho Mokae always on his element with a poem and story in hand. Spoke beautifully and gallantly about the speaker of the day. Took us to the Harlem Renaissance, and invoked the spirit of our ancestor Langston Hughes ….. Does it stink like a rotten meat? How do we respond to our ancestor after that rendition by Sabata-Mpho Mokae?..I sat there overwhelmed by emotions and thoughts. I was confronted with pressing questions on the Afrikan dream. Back to our returned son of the soil Professor Jean-Jacque Sene, wrapped in his Afrikan garb with an exercise book scribbled with circles laid before him. Roared “together we stand and divided we fall!” brought along with him several books on Pan Afrikanism. The books ranged from the great Burkinabe Joseph Ki-Zerbo, Olisanwuche Esedebe to the amazing Afrikan Horace Cambell. Reminiscent of the erstwhile spokesman of the Nation of Islam Our Dr Khallid Muhammad when he went to interviews. Prof JJ as he is commonly called in Sol Plaatje University, only found out at the lecture, he requested the books to be passed around while he takes us through his presentation, and he called this “dynamic learning” His interactive presentation brought you right back to the classroom if you have been away from it for sometime. The teacher and subject mastery was evident in Prof JJ’s presentation throughout, I guess it was one of the traits of a man who collects books for fun. The room became instantly quite when “what unite us as Afrikans?” was posed by Prof Sene. Shuffling of papers, camera clicks and whispers often a feature of these events disappeared for a moment as attendees cracked their skulls to make sense of whether this is a trick question or not. He stood there allowed the question to sink in, sigh punctured anxiety when he provided the house with an answer. Explained the four factors that bring us together as Afrikans. Namely Matriarchy, humanity, divine kingsmanship and continuum (ancestors and unborn). Went further to trace and relate important Pan Afrikan moments in history, particularly the watershed moment in the form of All Afrikan Peoples Conference of 1958. For the first time in history Pan Afrikanism broke ground in the Afrikan continent and Ghana was the custodian of the historic moment. Hon Chi Minh victory over the French army with rice peasants set a revolt wave across imperial colonies, which cascaded in many Afrikan countries that started to demand self-dependence and governance. He juxtaposed the Afrikan giants Garvey and Du Bois respectively, importantly their contribution to the Pan Afrikan ideology and Afrikan people across the world. Discussed several concepts such as “myth” “Sacriology” “geography” “chronology” and “ideology” at length. The pinnacle during the discussion was when he lamented that “myth is functional story” I personally learned a lot because some of this concepts have been used loosely without an in-depth analysis in some instances. Contrasted views on the genesis of Pan Afrikanism and deeply reflected on how it was given shape or form by the Afrikan diasporan’s thrust. Certain quarters argued Pan Afrikanism was born “at the base of the slave ship” and he is of the view that common struggle united Afrikans irrespective of their origins in the continent. The final part of the presentation was concluded with startling quantitative and qualitative analysis of Africa in comparison to other regions in the world. Touched on several contemporary issues such the death of Colonel Muammar Gaddafi, NEPAD and the dangers of World Bank. I think the presentation turned sour for me when the esteemed Professor Sene blew the horn of “Nelson Mandela” for his “peaceful revolution” at CODESA negotiations. Amid the fact that approximately 16 Million South Africans are dependent on the social welfare to eat. The rat infested townships a product of “peaceful revolution” that spans Limpopo to Western Cape Province. He witnessed the privileges minority enjoys over the majority of Afrikans, even they have racist exclusive enclaves in our country. I think he was flip flopping between Pan Afrikanism, Integrationism and Charterism of Kliptown. It is this confusion that deny the sacrosanct role of “race” in economic and social development, particularly Afrikan’s dispossession. South Africa is an off-shoot of the sacrifice made in CODESA and at the back of millions of Afrikans. I think one cannot commend Ho Chi Minh without appreciation of violence in achieving total liberation from imperial powers. Furthermore the Professor cannot caution or dismiss violence in the context of South Africa but heap tons of praise on the guerilla war of Algeria. Forgetting the north and south Africa faced the same settler onslaught at all fronts. I repeat the Mandelafication phenomenon is sad, it is wrapped around linen of “non-violence” “peaceful transition” “saved millions from slaughter’’ Afrikans based in America need to detox themselves from the supposed gallant Mandela “messiah” he was to the Afrikan struggle in the South of Africa. It might come across I am ranting on this text but I am genuinely not. Afrikans in Americas should stop being pedestrians on issues affecting Afrikans in the continent and abroad. Prof Sene appalling views on South Africa’s transition leaves a bad taste on my mouth, please don’t misinterpret this as anger. In fact I empathize with him because the dominant narrative is purported on the interests of those in real power, economic power. Generally I was not impressed with Prof Sene analysis on contemporary issues because it smacks of satyagrah principles which has never deliver true liberation throughout the world history. Its integrationist and charterist at best, which worries me because the said he is Pan Afrikanist. I had hoped he could have answered my question of what is an Afrikan? I might be at peace who knows. I think next time he should give the audience a chance to exhaust all their points or questions before he respond. An issue I would like to take with the organizers of seminars and public lectures at Sol Plaatje’s Humanities and Social Sciences, is the dictatorial facilitation of the events. A case in point is how Dr Jasmael Mataga’s chairpersonship at the preceded event, he was totally intolerant to engagement and debate. Summarily cut and dismissed participation from the audience. I think we need to clarify the terms of engagement and balance of power in dialogue, we cannot be at the mercy of the facilitator irrespective of the time. Firstly the lecture started late, the Speaker spoke at length and the audience when it have to engage the presentation is constraint by time. Logic should dictate that since the event started late, the audience should be given time to engage the presentation. A university is not a church where we go to listen and come back home, it should be a safe space for dissent and contestation of ideas. There is no consistency at all, I believe the organizers should clearly define the powers of the event facilitator and audience. We cannot sacrifice our time, only to be subjected to censorship and abuse from the facilitator of the public lecture. The behavior of the facilitator at the event in discussion here, must be problematized because if left unattended it will render future public lectures and seminars useless. 1would have like to know Professor Sene’s views of the “hands of approach” of Ghana towards South Africa, while it was harbouring activists and revolutionaries from the PAC and ANC. What would have been the factors that led to rivalry between Accra( Nkrumah) and Cairo (Nasser) in terms of Afrikanism? Did it have an impact on the consolidation of all Pan Afrikan forces across the continent? We cannot be race blind in the face of shameless exploitation of capitalism that is hinged on economic security for a certain race over the other. Case in point is apartheid. The public lecture offered an opportunity for sharpening of contradictions as my Marxist friend would often say, and it created the much needed safe space for critical thinking. The Sol Plaatje University’s Faculty of Humanities and Social Sciences did a great job and it should be commended for the spaces it continue to create. Halala MoAfrika halala, fire. You were firing chief. The el professor must feast on this and respond. What a piece man.